A contemporary film noir set in an economically depressed backwoods town, A Single Shot comes with impressive credentials – cinematography by Eduard Grau (A Single Man, Buried), production design by David Brisbin (Drugstore Cowboy, My Own Private Idaho) and a superior ensemble cast of Sam Rockwell, William H. Macy, Jeffrey Wright, Ted Levine, Kelly Reilly and Jason Isaacs. Nothing in the brief filmography of director David M. Rosenthal, however, suggested that he would follow such audience-friendly entertainments as See This Movie, Falling Up and Janie Jones with something so relentlessly dark. Based on the novel by Matthew F. Jones (who also adapted the screenplay), the film plunges you into a horrific situation from the start and then follows the terrible repercussions that fan out from there. Rockwell plays John Moon, an unemployed hunter whose wife has recently left him and wants a divorce and custody of their young son. Previously arrested for poaching, Moon continues to press his luck by stalking a deer out of season and shooting it. One of his random shots happens to hit and kill a young woman in the woods who was hidden behind some foliage. At first overcome with remorse, Moon re-evaluates his situation and decides to hide her body. In the process, he comes across a shack where she was squatting and discovers a box filled with mucho dinero inside. What does he do? He steals it and returns home to stash the loot in a hiding place. Not a good plan. Everything that happens from this point on is on par with the nightmarish, amoral universe of a Cormac McCarthy novel like No Country for Old Men. Despite strong performances by everyone and the atmospheric cinematography which captures the bleak, wintry setting where the action unfolds, A Single Shot is so determinedly grim, violent and despairing that there is little pleasure to be had in the telling…or any real point to its nihilistic worldview. Unlike some of my favorite noirs like Detour (1945), Out of the Past (1947) or Raw Deal (1948) where the flawed, self-destructive protagonists are still sympathetic, the protagonist of A Single Shot is more problematic. Rockwell is thoroughly convincing as a basically decent man driven to desperation but Moon makes so many ill-judged decisions from the start that he seals his own fate and alienates everyone around him…along with this viewer. It’s obvious Moon would be facing manslaughter charges or worse for accidentally killing a woman while hunting, a situation that would be further compounded by previous charges for poaching. But deciding to hide the body and not report it is the first big strike against him. Strike two is his decision to take the money and hide it. And strike three is when he dips into the loot and dispenses some big bills to his wife and later a lawyer (William C. Macy) in a bid to stop divorce proceedings against him. His generosity and the fact that he was previously penniless does not go unnoticed in his small town. The simple fact is that Moon is not that bright and Rockwell does his best to humanize this proud but hapless ex-farmer. 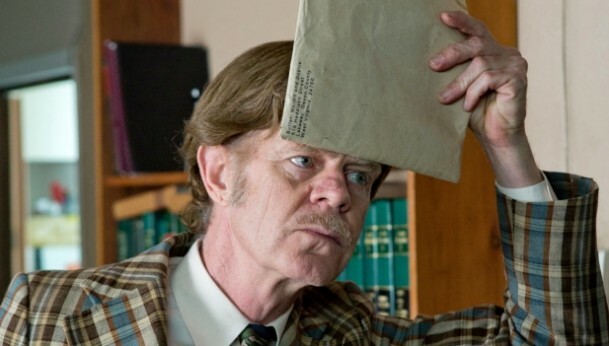 A Single Shot does generate a consistent, unnerving tension and provides some scene stealing opportunities for William H. Macy (in a laughable, ill-fitting toupee) as a corrupt lawyer and Jeffrey Wright as Rockwell’s always inebriated friend (his slurred country accent and mumblings could use subtitles). But the film is so pitch black in its conception that not a moment of lightness or levity is allowed to break the mood unless you count the brief appearances of Abbie (Ophelia Lovibond), a sassy young innocent who has a crush on Moon and seems to have wandered in from another movie. Her character seems to exist only to serve the grisly climax which reflects the film’s unironic title. Matthew F. Jones, who adapted A Single Shot from his novel, is a highly acclaimed author whose work is in the tradition of such noir masters as Jim Thompson and Cornell Woolrich (aka William Irish). But reading and imagining a backwoods gothic thriller like A Single Shot is a lot different than seeing it dramatized on the big screen where everything becomes much more explicit and exaggerated, particularly the violence. We know Moon is dealing with some remorseless, hardened psychopaths (Jason Isaacs from the Harry Potter film franchise and Joe Anderson of Julie Taymor’s Across the Universe) who place no value on human life except their own but director David M. Rosenthal’s tendency to dwell on the morbid detail (a deer being gutted, a throat being slit open, fingers being severed in close-up) becomes overly exploitative and eventually a wallow in human cruelty. Pets don’t fare any better so don’t hold out any hope for Moon’s devoted dog. 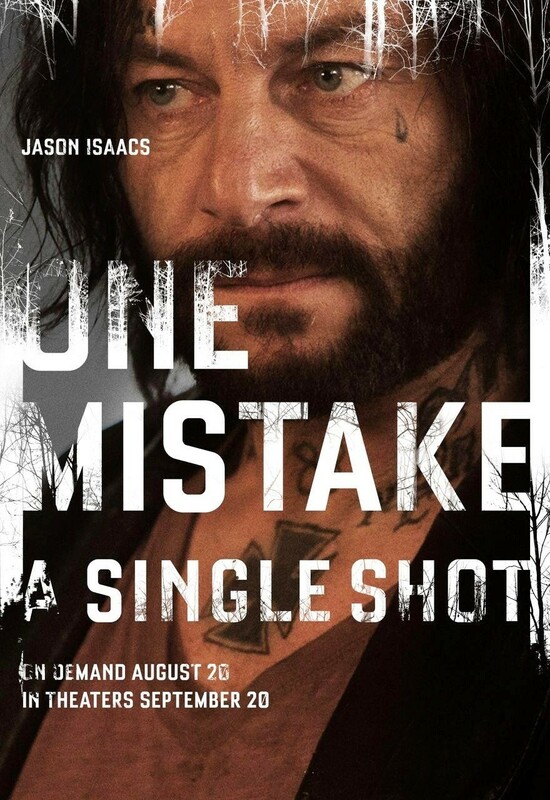 Still, A Single Shot has its admirers but you have to wonder what the film might have been with a different director and some of the actors originally considered for the key roles such as Michael Fassbender, Emily Mortimer, Thomas Haden Church, Terrence Howard, Jennifer Jason Leigh and Forest Whitaker. 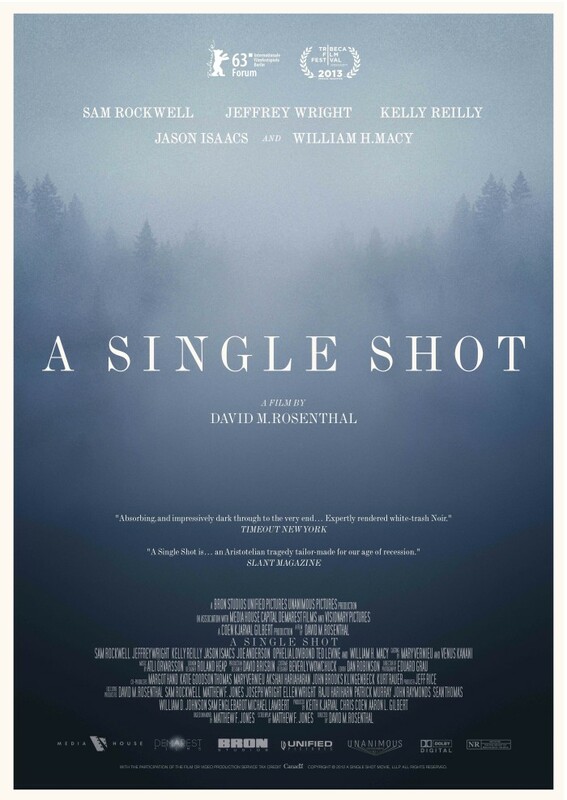 Currently A Single Shot is available in pay-for-view situations but has yet to receive a major theatrical release. Stay tuned for more film coverage of the 2013 Virginia Film Festival with reviews of The Missing Picture and Our Nixon. This entry was posted in film and tagged A Single Shot, Across the Universe, Cormac McCarthy, David M. Rosenthal, film noir, Jason Isaacs, Jeffrey Wright, Jim Thompson, Joe Anderson, Kelly Reilly, Matthew F. Jones, Sam Rockwell, Ted Levine, William H. Macy by JStafford. Bookmark the permalink.